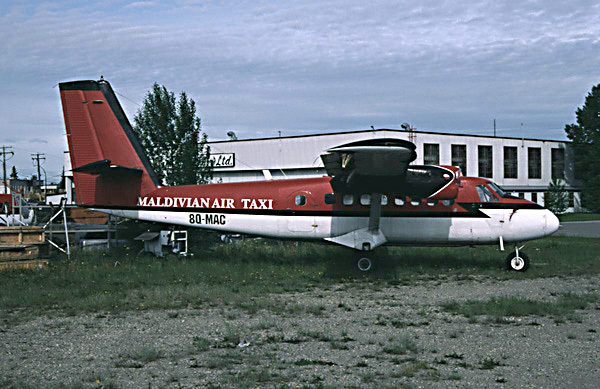 First originally delivered to the Jamaica Defence Force in 1967, this Twin Otter was later used by various Canadian operators, including Kenn Borek Air, who finally leased it to Maldivian Air Taxi in 1996. Based at Malé, it was used as a floatplane on sevices throughout the Maldivian archipelago. In 1999 8Q-MAC was returned to Calgary, where I captured it in June 1999. It is now destined for the Aero Space Museum of Calgary. My main interest is collecting colour slides of aircraft. As a collector I'm always interested in swopping high quality Kodachrome KR 25 / 64 colour slides. I already swop with a number of correspondents in Europe, Australia and North America. I have swopped colour slides of aircraft since 1969, and a fair part of my collection is made up by trade-ins. My speciality is the DHC-6 Twin Otter, of which plane the collection has grown up to about 950 colour slides. Next to the colour slides I collect, together with my wife, postcards of airports all over the world. If any image, text or opinion at the linked sites is against any public or private interest, please let me know. Suggestions are welcome.